Citing “adverse market conditions,” BrightSource Energy, a wholesale solar power generator, announced yesterday morning that it would shelve a long-planned initial public offering of 6.9 million shares that the company had hoped would fetch 21 to $23 each. The canceled IPO is a blow to the company’s backers, chief among them the American taxpayer. In April 2011, the Department of Energy awarded BrightSource a $160 million subsidy, from the same program that blew almost half a billion on Solyndra. They sure know how to pick ‘em at the DOE! BrightSource’s setback stands in stark contrast with this week’s ultra-successful IPO by Forum Energy Technologies, an oil-services provider. The company had hoped to sell 16 million shares, but demand far exceeded expectations, and almost 19 million shares were sold, at the high end of Forum Energy’s hoped-for price. 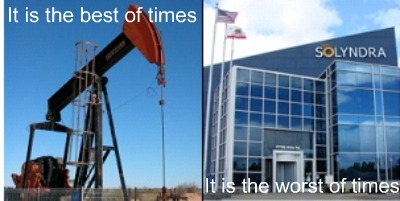 Because the services provided by Forum Energy Technologies engender a product—oil—that people actually want to buy*, the company does not need government handouts. *Unlike, say, concentrated solar power produced by BrightSource Energy, which California utilities are forced to purchase in order to comply with a Soviet-style green energy production quota enacted by the state legislature.